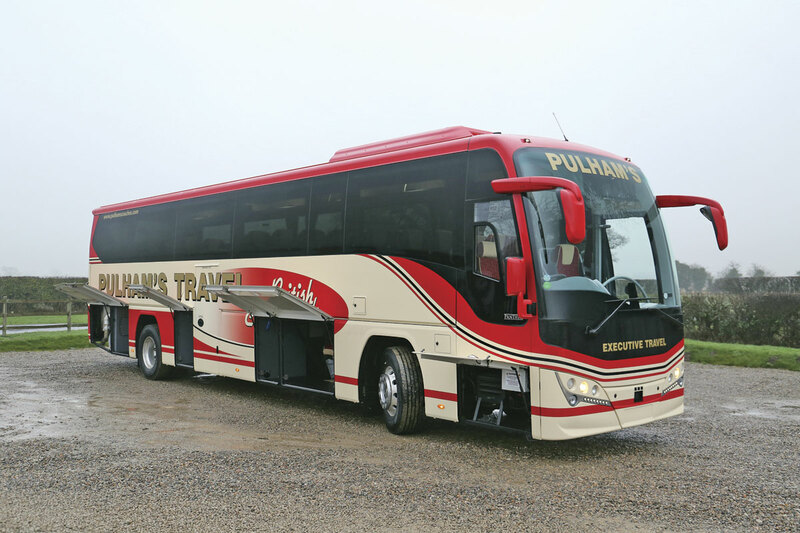 Now in its third generation, the Panther body style was originally launched in 1999/2000 under the codename ‘Coach 2000’ when, along with the pivot door Paragon model, it replaced the Premiere 350 and Excalibur models. At that time only 12m models were produced but that subsequently changed and the Panther family now covers the range from 10.8m to 15.0m. The Panther 2 followed in 2010 and the new Panther 3 was launched at the NEC in 2013 when an example for Alpine Tours of Llandudno was shown. With framework modifications to accommodate Euro6, the key changes introduced for the Panther 3 were revised styling, especially at the rear where the look was brought in line with that of the Elite with new light units to match and in the final window bay which is now angular rather than squared. At Euro5, Volvo offered coach chassis ranges with four different engine sizes; the B7R, B9R, B11R and B13R. At Euro6, there are only the two, the B11R and the B8R. Nominally, the B8R took over from both the B7R and the structurally similar B9R while former B13R applications were taken on by the B11R. 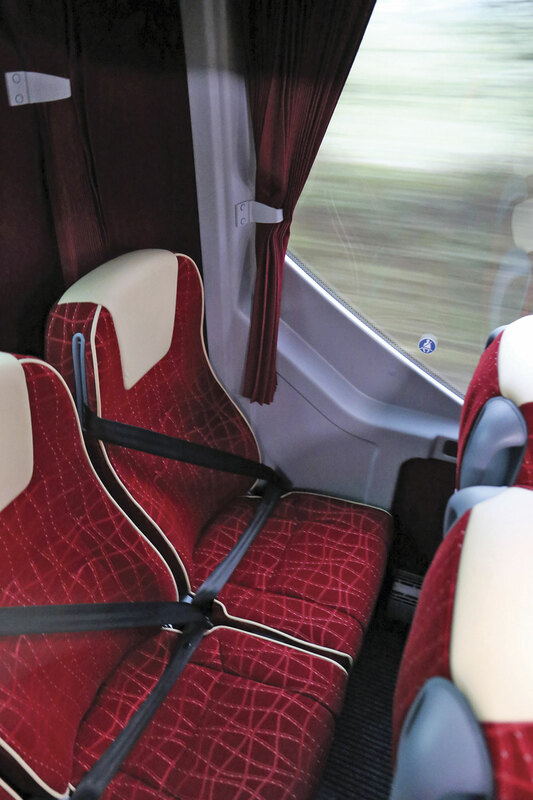 While Volvo Coach Sales only offers the B8R in conjunction with lower/standard height bodies and shorter models, Plaxton has taken a different approach. 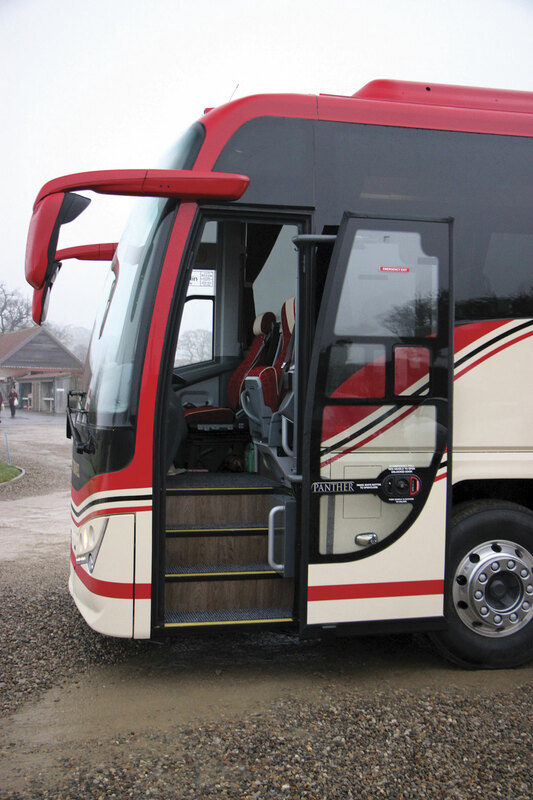 In addition to producing the Leopard as its versatile entry level coach, it offers the high floor Panther 3 coach on the B8R. It continues to be available on the Volvo B11R as well, these two chassis being the only ones currently offered with the Panther though earlier generations were sold on a variety of bases including the Iveco Eurorider, MAN R33, Scania K and Dennis R-Series. There may be less chassis options than there were, but Plaxton has continued to develop the Panther to offer a good choice of body alternatives. Panther 3 is currently available in five length options, soon to be six. These start on the B8R with the 10.8m Panther Cub which has a maximum seating capacity of 45 (or 43 with rear saloon toilet, as supplied last year to Pearces of Oxford). 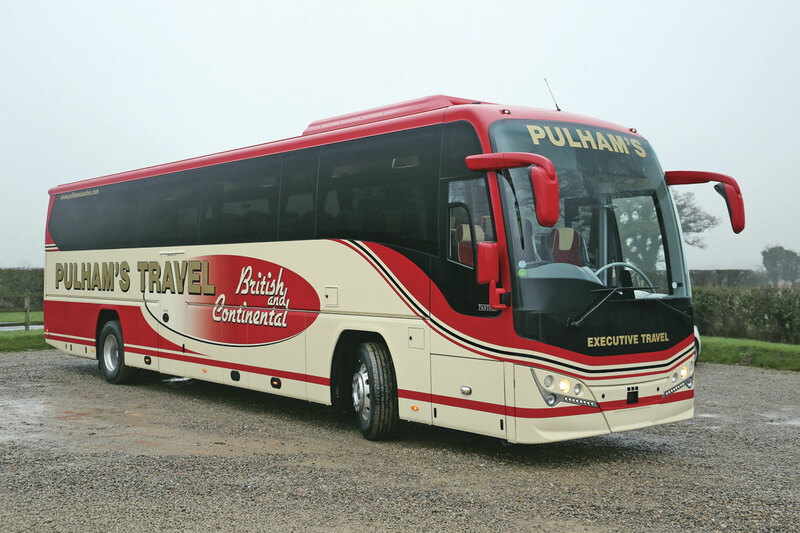 Currently only on the B11R is the 12.6m Panther 3 which gives you up to 53 seats. This comes as standard with the wider entrance door necessary to accommodate a front PLS lift, the preferred option for many running express or commuter services. 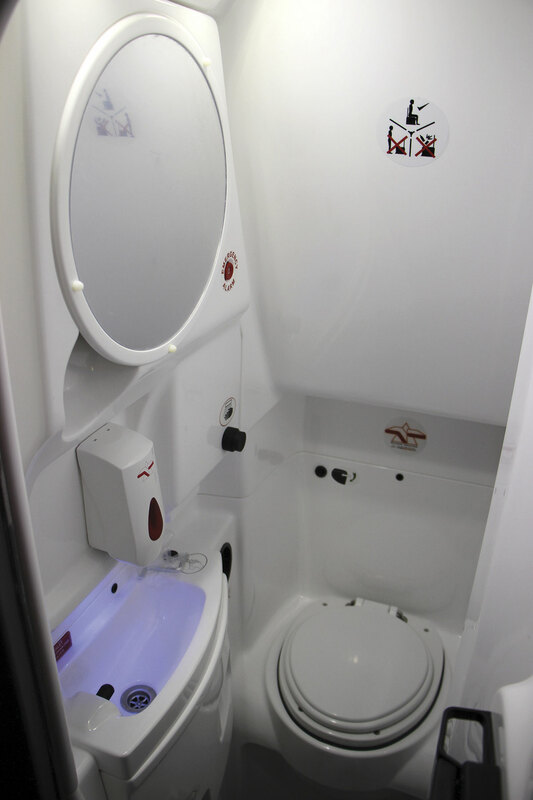 At 12.8m there is the choice of the B8R or B11R which offer a maximum seating capacity of 59 (61 on B8R)with no toilet. Longer alternatives are the tri-axle B11R 6×2 mounted 14m and 15m variants popular for express work and with maximum seating capacities of 63 and 69 respectively. They are not exclusively for express duties, just as operators such as Acklams and NAT have purchased Elite-i overdecker coaches for touring and private hire work, Kenilworth based Ridleys Coaches took delivery of a 14m B11R Panther 3 last year with 61 seats and a toilet. Scheduled to come towards the end of the second quarter this year is an additional 12.2m long model on the B8R, the first orders for which have already been taken although Plaxton are not ready to reveal who the customers are yet. 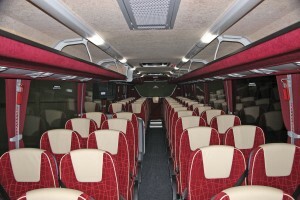 This offers 49 seats with a centre toilet and continental door. 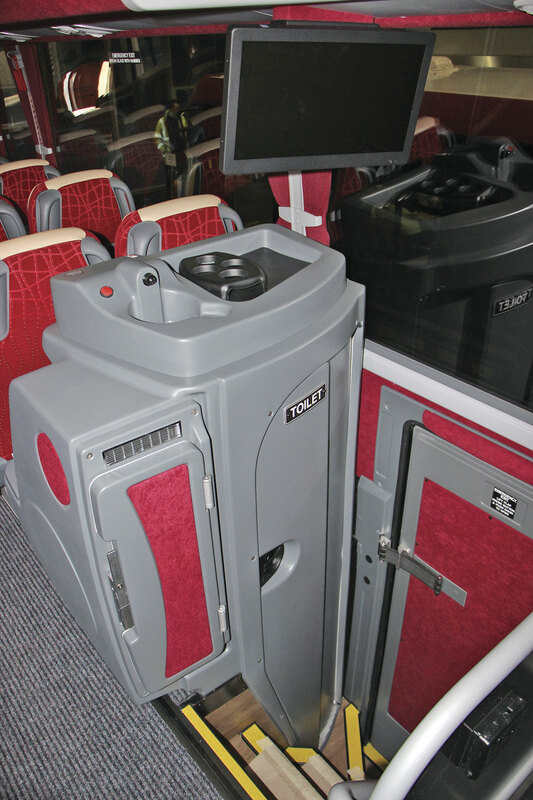 It has not been engineered as a straight seated coach yet, but could offer up to 55 seats without the toilet. 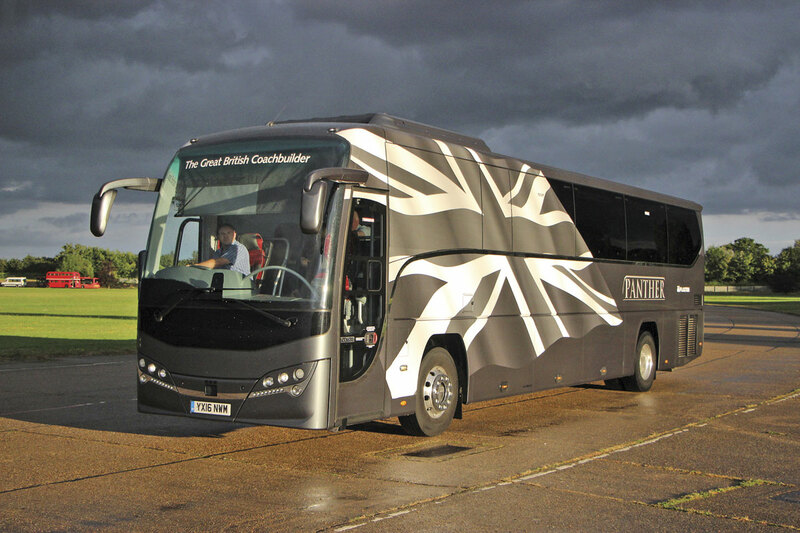 Many readers will have seen or even tried a Volvo B8R Panther 3 demonstrator in a bold silver livery with contrasting Union Jack motifs that has been doing the rounds during 2016; it was certainly kept very busy when I saw it at the CPT’s open event at North Weald in the summer. Rather than evaluate that vehicle, Stuart Jones and Andrew Fowler went up to Scarborough earlier this month to try out a 12.8m B8R Panther 3 coach that will shortly be entering service with the well known Cotswolds based operation, Pulhams, a regular Plaxton customer over the years and a fleet that already includes a Plaxton Leopard bodied Volvo B8R. 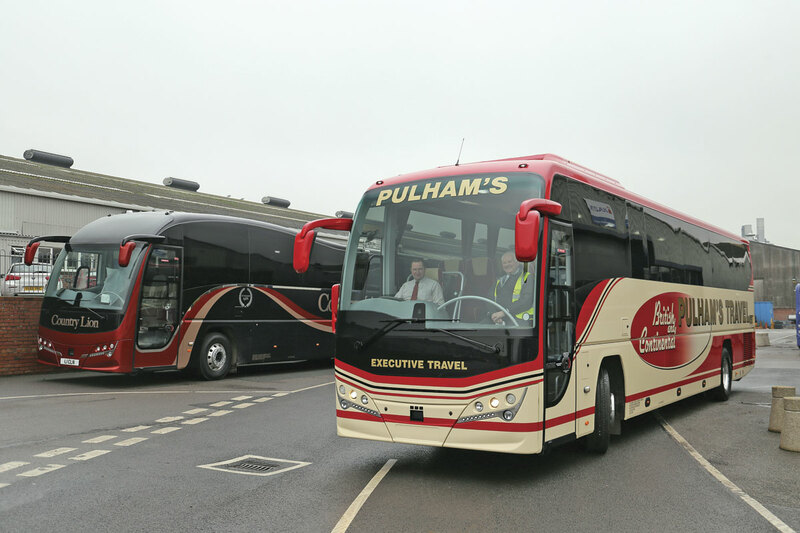 Having spoken to Commercial Manager – Coach, Mark Ballam, at the plant, we were joined by Customer Account Manager, Ken Albon, for the on road evaluation. With a framework constructed of 12% chrome steel, single piece composite main side panels that are bonded and mechanically fixed to the structure and locker panels framed and skinned in aluminium, it is well protected against the elements and does not suffer from the corrosion problems that were sadly all too familiar to those operating the Paramount and Premiere ranges. Panthers originally had stainless steel stretched side panels but composites have been used since 2011. A one-piece aluminium roof panel is bonded in place and the front and rear GRP panels are both bonded and mechanically fixed. The front screen is a direct glazed 7.8mm laminated unit and the double glazed side windows are bonded in place. 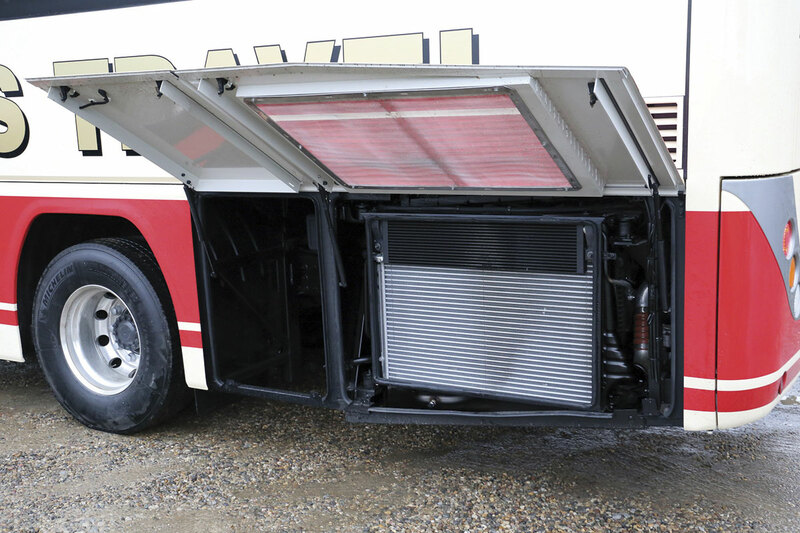 Two lift up roof ventilators are located towards the rear of the coach, the forward roof section housing the ThermoKing X900 air conditioning system. Mekra exterior mirrors have housing matching the body colour of the coach and there is an additional mirror unit at the lower forward edge of the offside A-pillar. Most of the underfloor luggage space is within the wheelbase though there is a useful locker at the rear of the offside that most drivers will commandeer for their cleaning equipment and personal effects. In truth the cab area itself is not over-endowed with driver storage space, especially if the dash fridge is specified. 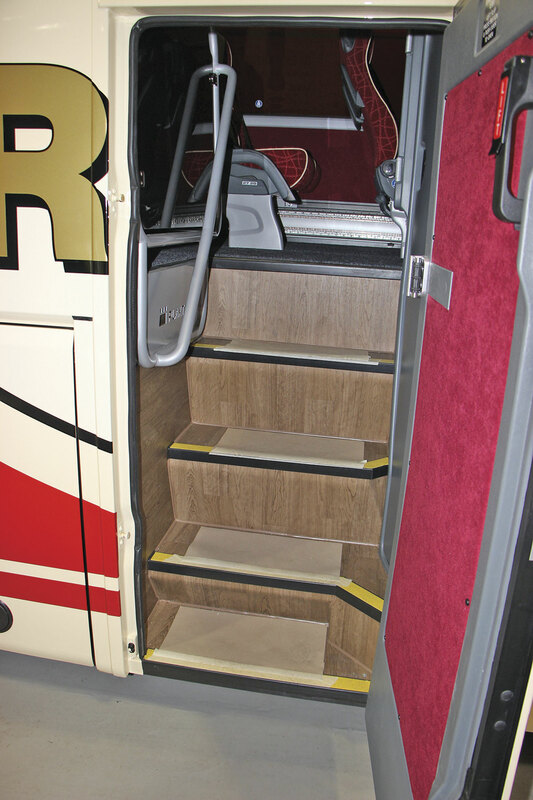 The centre staircase and demountable toilet does occupy a good deal of the offside but all of the available luggage area is easily accessed. 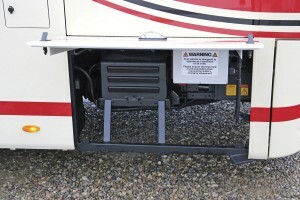 At the rear, though top hinged flaps give good access to the radiator (nearside) and emissions muffler (offside), the engine is located behind Plaxton’s conventional arrangement of a shallow full width hinged top flap that lifts easily to give access for topping up (if you are tall enough) and a more difficult to remove main panel that means you are going to get dirty if the weather is inclement. Might a larger single panel be easier? Plaxton consider all daily checks can be accessed with the upper panel open and the lower engine access door can be opened partially should this be required however removal would generally only be required when the vehicle is in for maintenance. From the outset, all Panthers have been equipped with powered plug doors; those requiring a pivot unit being catered for originally with the more upright fronted Paragon, and latterly with the Leopard. That on the Panther 3 has a toll window incorporated and operated smoothly. Wood effect flooring was one of the options that came in with the Panther 3 and this had been used in this coach, though for the most part you wouldn’t have known because the whole of the passenger saloon floor was covered in ribbed carpet. Where it was evident was in the driver’s footwell, in the stairwell of the centre door and on the risers in the main entrance. Here, there were four steps from the ground to the platform area followed by one further step up to the saloon which, after a slight slope across its full width for a couple of rows, was flat. 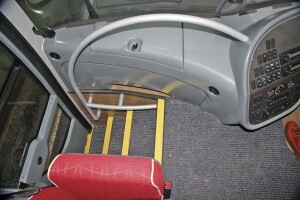 Hand rail provision was good and, in common with other Plaxton coaches, there was additional low rail provision to the left when ascending that provided a welcome foot bar for the courier. Both the courier seat and the Grammer MSG 90.3 air suspended driver’s seat are trimmed to match the passenger seats which to my mind helps give a seamless transition from the entrance to the saloon. 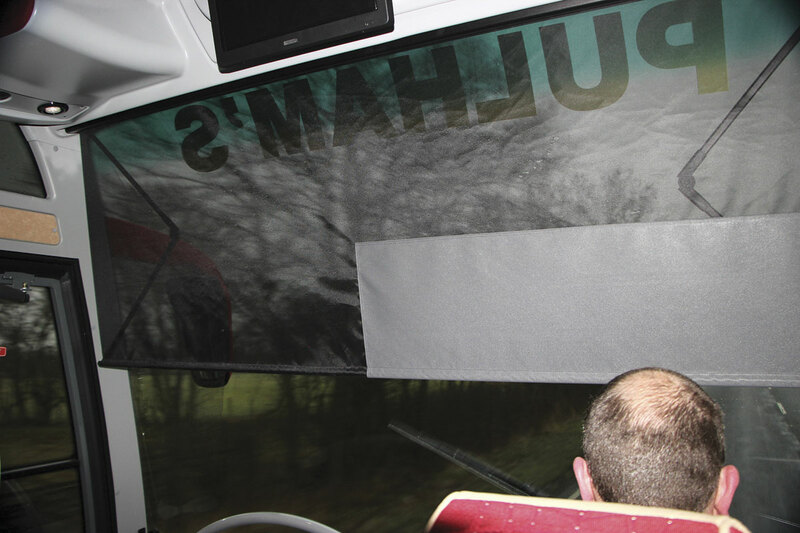 The driver has a full width powered sunblind that is solid in lower part of the offside section and mesh elsewhere, giving clear visibility of the nearside mirror. A powered driver’s signalling window and 12v accessory sockets are also provided together with a Bosch combined radio/CD/DVD payer with PA system and driver and courier microphones. Interior design is always a subjective decision and my preference has always been for soft trim over plastics on roof surfaces and in areas where it is not vulnerable to mop damage on the grounds of enhanced comfort, warmth and sound deadening. 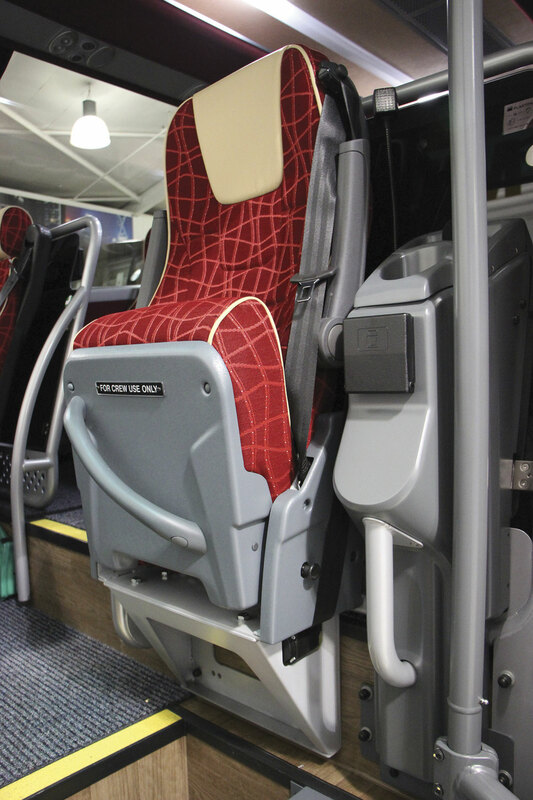 Plaxton has standardised many items, such as the racks, across a number of its models. With pleated curtains to the side and windows, a light beige ceiling trim, full length lights along both sides of the ceiling, additional lights over the entrances, trimmed rack undersides, good headroom and large windows including one at the rear, I feel that the result is very effective, giving a balance that is inviting yet practical. 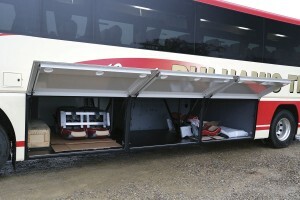 As well as the air conditioning, which is controlled from the dash, full length skirt mounted convection radiators run the length of both sides of the saloon and there are air vents as well as speakers and reading lights in the passenger service units mounted at a shallow angle on the window side of the rack undersides. 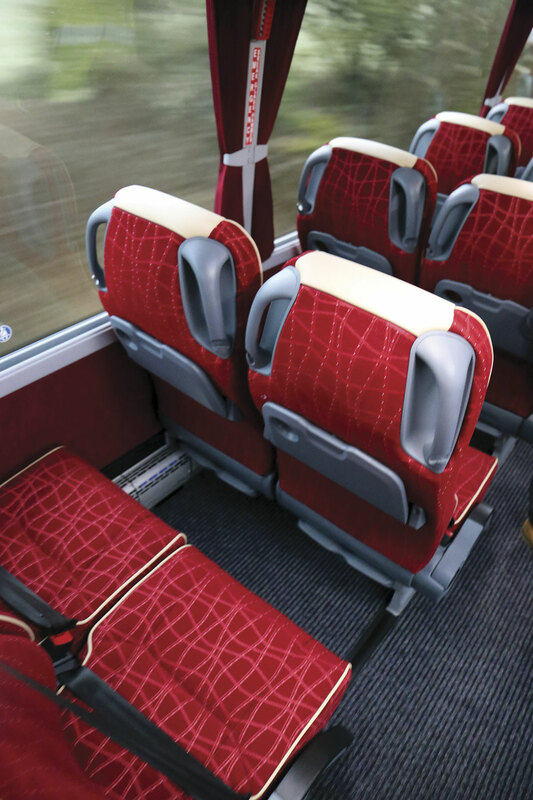 Plaxton try to offer the options operators want although the standard specification is designed to meet most needs. 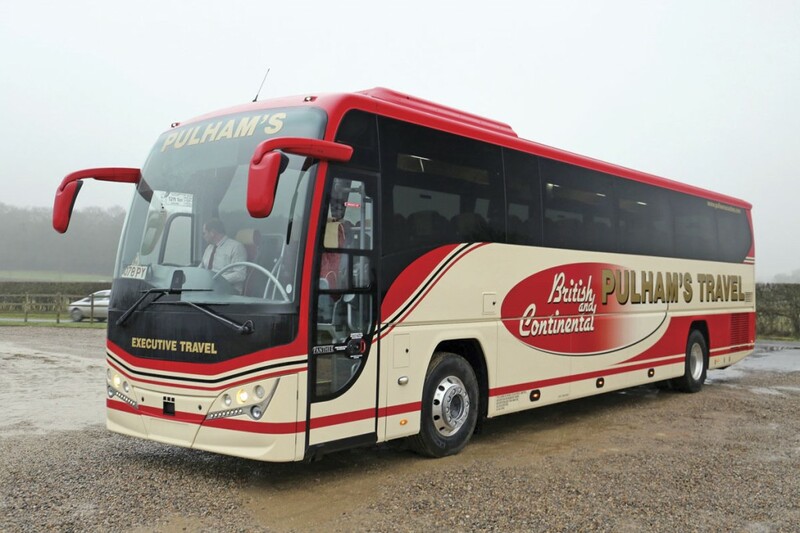 Pulhams have opted for a number of upgrades to their coach, among them an 18.5inch Autosound monitor at the front and another above the toilet compartment, a Shades P6 fresh water flush centre demountable toilet with jumbo roll dispenser, a drinks boiler and a front loading coolbox. There is a choice of three reclining seats: the standard Brusa Extend 300 or the Fainsa Gala and Politecnica Relax GTE which are cost options. Brusa’s Extend 300 is three-point (all age) belted and Pulhams have gone for these with the optional additions of leather piping and headrest panels. They did not take the sports trim package which adds leather side panels to the squab and backrest face but did choose to take seat back tables. Adjustable footrests were fitted along with aisle armrests and grab handles with integrated coat hooks on each side of each seat back. A wide range of trim options is available to those specifying their own vehicle rather than buying from stock. Other options that could have been specified include a top loading fridge in place of the driver’s storage area in the nearside dash, motorised Bosch monitors, rack locker doors and USB charging points. I have generally found the rear corner seats the least comfortable on a coach and sat in this position there was slight elbow intrusion from the window moulding but I still had reasonable legroom and could just deploy the seatback table, even when the seat ahead was reclined by the full 75mm, though I could not do so and keep my feet on the footrest. An additional cup holder was mounted on the offside sidewall to make up for the lack of a table at the centre seat. Presumably it means the person in the centre seat is supposed to use the drinks holder in the tray of the person to their right and so on. The best of luck with that. Volvo’s B8R 4×2 chassis has at its heart, or at the rear to be more precise, the Euro6 Volvo 7.7-litre D8K in-line six-cylinder common rail engine producing 350hp (258kW) at 2,100-2,200rpm and peak torque of 1,400Nm at 1,200-1,600rpm. This is the highest output offered with the B8R and all UK models are equipped with it rather than the 280hp or 320hp variants. The Pulham’s coach had the standard transmission option which is the Volvo I-Shift AT2412E 12-speed automated manual unit. The alternative is a six-speed fully automatic ZF EcoLife gearbox, a cost option that adds around £3,000 to the overall price. 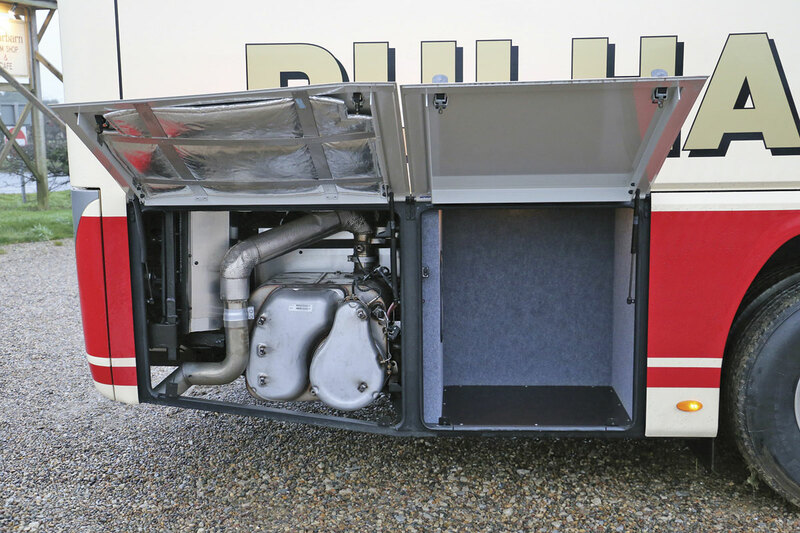 Handling exhaust emissions on the Euro6 D8K engine is a combined muffler/silencer unit mounted on the offside rear of the chassis that incorporates SCR (Selective Catalytic reduction), EGR (Exhaust Gas Recirculation), a DPF (Diesel Particulate Filter) and a DOC (Diesel Oxidation Catalyst). Volvo does offer an exchange service for DPF filters. Apart from the engine and packaging associated with emissions control and cooling, the B8R is much the same as the earlier B7R and B9R chassis. Key chassis components such as the axles and steering are carried over from the earlier generation chassis; indeed they are also common on 4×2 versions of the B11R. Volvos now sport a formidable list of safety equipment as standard, some of which are now legal requirements. This includes the ESP electronic stability programme, ABS anti-lock braking, BA brake assist, a hill start aid, ASR anti slip regulation, and the EBS5 electronic braking system, and, within the DSS driver support system, EBA emergency brake assist and LDW lane departure warning. There are disc brakes all round, a Siemens VDO digital tachograph (badged Volvo) is fitted, the suspension is full air, and there are 60-litre AdBlue and 420-litre fuel tanks – both with dash gauges. 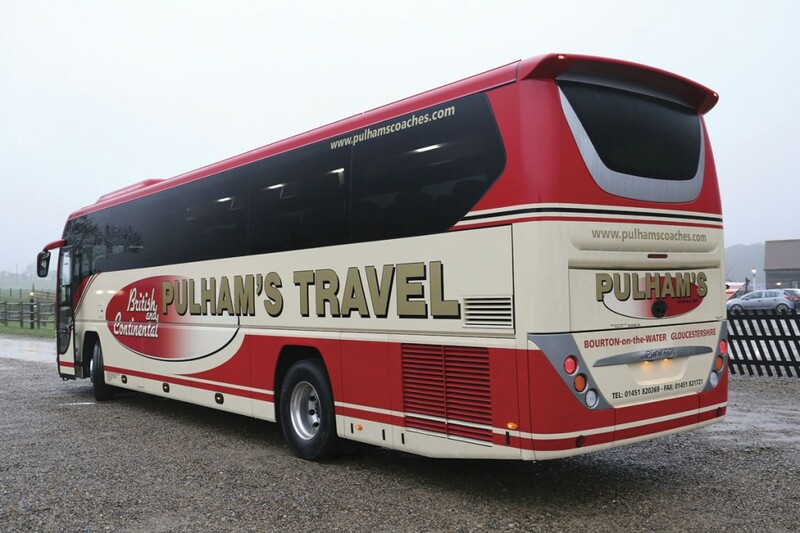 Durabright 22.5inch alloy wheels are fitted with Michelin R295/80 R22.5 tyres and wheel trims and a spare wheel is provided situated behind the lower front panel at the front of the coach. As on the Volvo bus range, there are two separate sets of batteries, one dedicated to starting the vehicle (I-start). A newly introduced additional safety system is the highly impressive VDS Volvo Dynamic Steering system, which is exclusive to Volvo and massively reduces the effort required to steer a coach. Available on the B8R as well as the B11R, though I believe nobody has yet specified it on a B8R, it greatly reduces the exertion required from the driver and is especially useful when manoeuvring. VDS is a cost option and can be specified immediately on new build chassis. This is the third Volvo B8R we have evaluated, following a 12.8m Plaxton Leopard demonstrator in February 2014 and a 10.6m Sunsundegui SC5 in May 2015. In both of those previous coaches we noted how much smoother the driveline was than in either the B7R or the B9R, particularly so in the case of the latter. It is possible that I have forgotten just how good my earlier experiences were, but riding on the Panther B8R combination it seemed to have taken another step forward, not only in the quietness of the driveline and the absence of any evidence of it changing ratios, but especially in the quality of the ride which was without doubt the most comfortable I have experienced in some time. It is astonishingly well balanced with none of the slight nod you can get at the front of the B11R and remarkable ability to eradicate the effects on the ride experience of imperfections in the road surface. It isn’t silent, that’s impossible, but even at the rear, directly over the engine you don’t need to raise your voice at all to carry on a conversation; you could whisper and still be heard clearly. Staxton Hill on the A1249 used to have a sign at the top instructing East Yorkshire Motor Services drivers to engage a low gear before continuing and there remains a lengthy gravel run-off trap to provide a safe haven for vehicles that run out of braking capability on the lengthy descent. On the way up, two signs remind you that it is a 17% incline so what better way to try out the B8R, albeit unladen. Andrew did not push it, but even so the coach maintained momentum, never dropped below 25mph and had power in reserve, accelerating seamlessly as the incline lessened. We continued until a roundabout afforded us an easy turning point before descending again. Andrew let the coach do all the work, activating the position two of the retarder and simply steering. The system coped effortlessly and automatically with the steep twisting road, evaluating the gradient and reacting accordingly, slowing for corners. ‘I didn’t have to touch the brakes once, you rarely do except for the last bit to bring it to a standstill,’ he said. The Fowler fleet includes a 12.8m B12M bought new a decade ago and Andrew noted how the steering had improved in the interim with the result that the wheelbase was far less noticeable in the B8R. 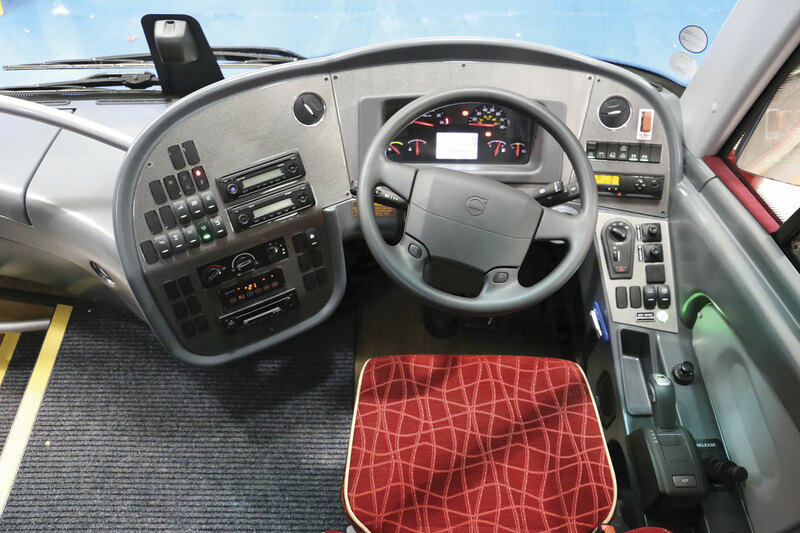 He also commented on the improvement in the I-Shift. ‘It is set up well, it doesn’t rev and clunk down like it does on the B9R and the B12, it’s much smoother’. With the rain still falling and the mid winter light starting to dim a photo stop was becoming urgent. Unfortunately, discussion of a technical issue meant we missed the spacious lay-by Ken had intended us to use so he suggested we pull in to the Cedarbarn farm shop and café instead. It looked a good call until we got through the gate and found a wooden fence in rather too close proximity to the solid gateposts and we thanked the deities that Andrew Pulham wasn’t watching us in his new coach. Unfazed, if a little quiet, a few shunts later Andrew safely had her through, we took the pictures and mused that regular visitors might well be customers for the 12.2m variant in the future. One thing we did notice was that when you let the handbrake off quickly during manoeuvring, it makes a sound as if you’ve blown the horn. We tried the lane guard system and it worked instantly and effectively, but there was mutual agreement that we wouldn’t do the same with the emergency brake assist. We won’t be making that part of our evaluation unless we are on a test track, but not on an A road in the increasing gloom. Ken said a change to the dash display setting have shown us what gear we were in at all times but we were able to ascertain that at 60mph on a dual carriageway it was doing 1,400rpm in top and when you accelerate up through the gears it drops into top at around 49mph and at 50mph you are only using 1,100revs, right at the bottom of a green band that stretches from there to 1,600rpm. At the front I thought how quiet it was. Moving along the length of the interior it was really quiet and at the rear it remained so. Returning to the front as the weather deteriorated outside, I could detect a very minor amount of what I thought was wind noise but could (as Ken suggested) have been road noise and it was minimal. The other thing that surprised me was how rigid and quiet the body was with no sign of rack rattle or even window shimmer at tickover. The only untoward noise I encountered was a small amount from the toilet door. Andrew found a lot good with the detail of the body. One thing he noted was the much more substantial box housing the door gear, which looked much harder wearing that some earlier solutions. 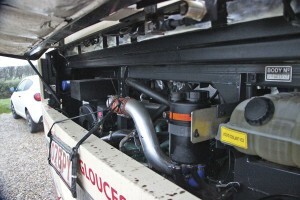 It has arguably never been more difficult for an operator to decide what to purchase for a business, with the impossible conundrum of needing Euro6 for an increasing number of Low Emission Zones while in the medium term there is political pressure for non-diesel propulsion which would require products that are not currently available. Against this background, the need to buy coaches that are as flexible as possible but will pay back their investment as swiftly as possible is as strong as it has ever been. Clearly, you don’t want to compromise the passenger experience if at all possible and when all of these factors are taken into account, plus the existence of reliable and proven support networks, the B8R Panther 3 looks a convincing package. 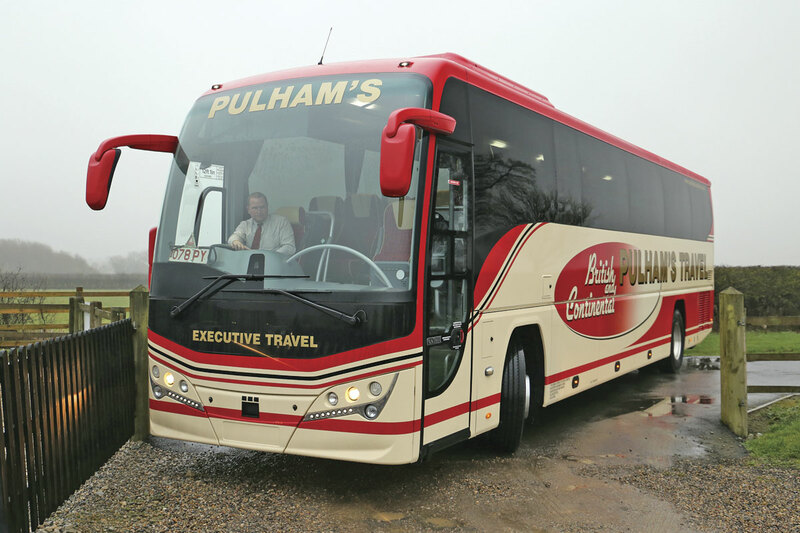 Retail prices for the 12.8m model to executive specification are from £238,000, which is £10,000 less than the same body on the Volvo B11R chassis and £20,000 more than a Leopard on a B8R (£218,000). Incidentally, the 10.8m long B8R Panther 3 Cub retails at £232,000. Stock vehicles are already in build and will be emerging from the lines at regular intervals in the coming months, so availability should be virtually immediate. If you want a bespoke example orders are currently being taken for delivery in July/August. Coincidentally, Andrew recently placed an order for a new B8R Leopard (his first brand new Plaxton since a Javelin Profile a decade ago) that was on the first station of the production line when we visited Scarborough. Among the good reasons for others to consider taking the step up from the Leopard to the Panther 3 is the ability to specify a toilet compartment, something you cannot do on the Leopard because the emergency door is at the rear and there is insufficient height available above the engine to accommodate a toilet unit, although the internal height of both models is the same. Another is luggage capacity, the 12.8m Panther 3 giving you 9.3cu.m with centre toilet and 11cu.m with a rear saloon toilet. Both capacity figures are significantly more than you get on the Panther 3 B11R with centre toilet which provides 8.5cu.m. It may well be that those looking for an auto Panther 3 will be tempted by the B8R because only the 380hp version of the larger D11K engine can be matched with it, which isn’t a huge leap from the B8R’s 350hp. A growing number of operators have already gone down the Panther 3 B8R route. Customers have included Whites of Oxford, Pearces of Oxford, pairs of 61 seaters for Seawards of London and Bakers of Moreton in Marsh, Country Lion of Northampton who have another on order to a high specification matching that of the B11R 6×2 Elite shown at the NEC, and Ridleys of Kenilworth, among others. Standard Plaxton warranty is 12 months on the body although second and third year cover is available at cost. Volvo warranty is 24 months on the entire chassis plus third year cover up to a maximum of 455,000km. Other packages are available for more specialist applications. In addition Volvo offers a variety of Repair and Maintenance packages, depending on the level of work an operator wishes to retain. These include parts supply contracts, ‘Blue’ contracts covering all necessary preventative maintenance, Operator’s License Inspections (OLI) and annual MOT (i.e. steam clean, pre-test inspection and presentation). This includes all genuine Volvo parts required for servicing but excludes labour, worn out parts or components to fix defects. The ‘Gold’ contract is the belt and braces option either for the chassis only or chassis and body. For a monthly fee Volvo technicians undertake all necessary chassis maintenance, OLI inspections, MOT and repairs of the bus or coach using genuine parts and lubricants. From Euro 6 onwards Volvo has also offered 12 months free access to its Telematics Fleet Management system, a real-time online service specifically for bus and coach operations, providing detailed operational information on each individual vehicle. Fuel consumption, emissions, driving profile, technical alerts and events as well as positioning data are presented in clear and concise reports. Coincidentally, Andrew Fowler has recently purchased a 2007 Panther bodied Volvo B12B that had spent the intervening decade with Pulhams. One of those completed by Plaxton to the special centenary specification with 53 seats and a toilet, it has seen work on touring and private hire duties although its final duties for the company were on a rail replacement contract. Largely as a result of legislation restricting the ability to radically alter specifications in later life, coaches have generally become less easy to cascade over the years than they once were, but this B8R Panther 3 Executive combination offers the prospect of being able to fulfil just as wide a range of roles as earlier generations for a full life, assuming that diesels are still permitted in a couple of decades time. 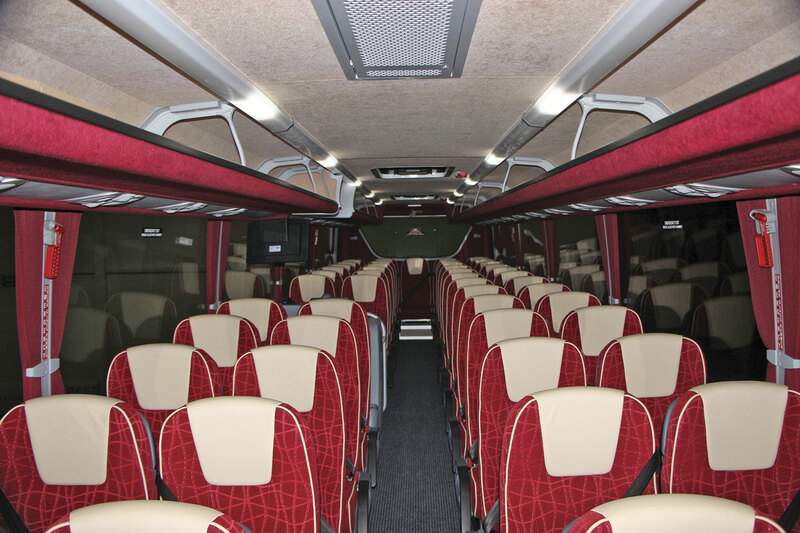 To ensure this, it is homologated for use as a 57 seater with toilet or a 59 seater with the toilet removed, with the additional seats and rack units to facilitate this supplied at the outset. Both Andrew and I liked it a lot, not just for the driving experience and the comfort but for the versatility it offers and the ability to keep it occupied in the long term. There will be those who would prefer to spend an extra £10,000 and go for the B11R, but for most operators I question whether this isn’t a saving you can happily make, the more so when you see the mileages Euro5 B9Rs are covering on demanding express work. The Plaxton body has always had a lot of customer appeal yet aged gracefully and it appears that this latest generation is probably the best built yet.